When it comes to pricing, we believe in being upfront and transparent. Our goal is to offer high value junk removal solutions at a fair price. Rubbish Works rates are based on volume and content. 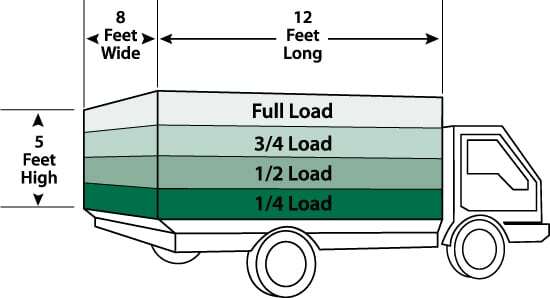 Meaning, what the items are and how much space they take up in a truck. Most pick-ups use the standard Pick-up Rates. However, construction and remodeling debris, concrete etc. would use the Heavy Load Rates. The load rates include a full “Done for You” service: crew, truck, labor, and disposal. For cleanups or cleanouts that are very time consuming and require labor or effort above and beyond the standard (one hour per full load for two crew members), additional labor is charged at an hourly rate per crew member. Important Note: The rates are a guide to provide a general idea what your project will cost. A firm quote can be given for your acceptance once our team arrives onsite. At Rubbish Works, you are only charged for the actual amount that is removed plus added labor it takes and applicable material surcharges (if any). Current promotions, the size and complexity of a job, discounts and other considerations may be applied on a per project basis. Specific pricing varies by city and region, and a “a lot” of debris or “not much” can mean something different depending on who you ask. For that reason, we offer complimentary, no-obligation estimates with the choice for immediate service. To find the most current retail rates simply enter a zip code in the “Schedule Online” box and click GO. The Project Information page will appear and the rates for various load sizes will display.